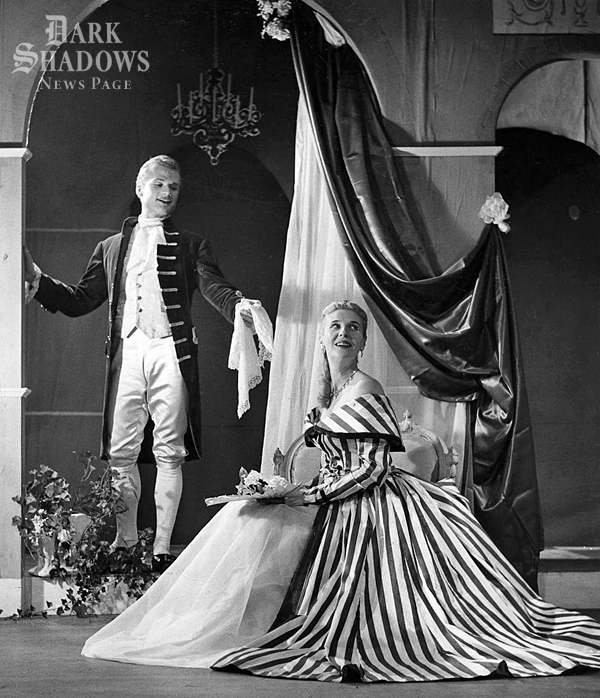 This week it's a rare press shot of Louis Edmonds (Roger Collins) in the 1954 New York revival of Restoration comedy The Way of the World. Louis played the lead role Mirabell and is pictured with his co-star Gerry Fleming as Millament. Dark Shadows' Thayer David (Professor Stokes) also appeared in the same production. Writing in The New York Times, critic Brooks Atkinson suggested that: "Edmonds will make an excellent Mirabell when he speaks with more grace and clarity and relaxes a little bit." Meanwhile, The Herald Tribune's Walter Kerr was distinctly lukewarm about both the play's leads: "Neither lacks the hauteur or diction essential to this kind of verbal antic, but both... spend most of their time chasing musical notes uphill and down dale, letting humour lag." I love Actor Louis Edmonds...'what grace and power he processes when hiting the stage. A high-caliber Dramatic/Theatre' Actor in every sense of the word. Loved him as Roger Collins/Classic DARK SHADOWS he played that Iconic character so well with charismatic-stoic and serious success. Rest in sweet harmony, Mr. Edmonds: he looks very enchanting in this vintage stage shot w/his Co-leading lady Ms. Flemming. Beautiful! !